By the time you read this, the euphoria of England’s victory over Colombia will have started to fade and we will return to the surreal atmosphere that Brexit has come to mean. We are well past the stages of shock, disappointment and anger now, and what has descended is a kind of numbness, a lack of feeling altogether, about what should have been a time of excitement, optimism and national renewal. We live in a kind of flameless Hell, where the Damned are permanently stupefied by novocaine. The latest development, if the tweet below by Andrew Neil is to be believed – and he is a man not known for inaccuracy – is that Theresa May is threatening Brexiteers with remaining in the EU if she doesn’t get her way! Far from no deal being better than a bad deal, the May Government now telling Brexiteers that no deal is not an option and that if they don’t accept what they think a “bad” deal then UK likely won’t be leaving EU at all. Simples! If so, she is either mad or bad. The irresponsibility of such a tactic beggars belief. I would say it is scarcely believable but nothing really surprises any more. The country would without question be plunged into a cold civil war, with trust in Parliament and the ruling elites gone for ever. A reckoning might not come today, or tomorrow, but it would surely come. Why then, do we all feel so little? The answer is that Theresa May is an emotional vampire, draining passion and feeling from those around her, and, at second hand, the nation itself. She governs through an extremely nasty form of psychological bullying sometimes called ‘the power of silence’, which is far more effective in cowing rivals than, say, Sir Alex Ferguson’s notorious ‘hairdryer’ outbursts that he used to terrify Manchester United players. May is notorious for being enigmatic – i.e. not saying very much. It doesn’t sound very intimidating, but just try it. Ask someone with whom you spend a good deal of time simply not to speak to you for a while. Very quickly you will become highly stressed and confused, and will do anything to return relations to normal, including giving in on whatever point of contention there is between you. It is impossible to win an argument with someone who refuses to argue at all, and this cruel but highly effective tactic eventually wears you down. Thus May almost always wins, slowly grinding down the opposition and narrowing the options through inactivity until a ‘consensus’ (that is the only remaining option left) emerges and her a*** is therefore well and truly covered. Of course, this has disastrous long-term consequences, but it saves her skin for another day. It’s true that Tories generally are not known for their courage, but nevertheless one must have some sympathy with the cabinet Brexiteers who have to face this behaviour week in, week out. Look at them now, husks of men, drained by the bloodless Nosferatu of Downing Street. 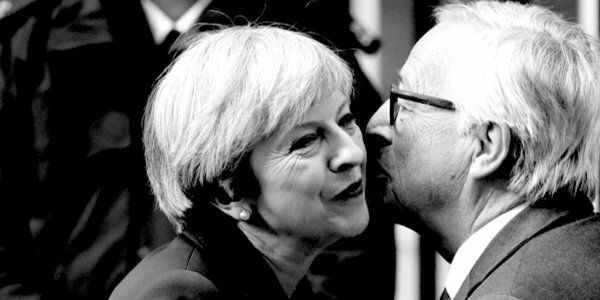 Brexit, and what could have been a time of great national renewal, has been the victim of her unbounded selfishness and cowardice and the psychological tactics she uses to avoid genuinely confronting issues. The emotional desiccation we feel is the dismal side effect. It will not relent until she is removed from power.